A £120 million revamp of Peterborough’s South Bank lacks ambition, it has been claimed, ahead of a decision to decide the site’s future. 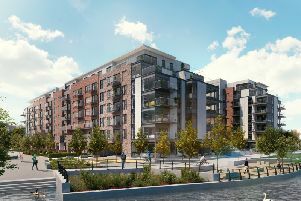 Peterborough City Council’s Planning Committee decides on Tuesday whether after a 30-year wait to regenerate the Fletton Quays site, developers can start work on 280 homes, a 160-bed hotel, two office blocks and restaurants. However, the plans put forward by the Peterborough Investment Partnership - a joint venture between the council and Lucent Strategic Land Fund to deliver investment in the city - have been criticised by the Peterborough Civic Society which feels the idyllic scenery of the River Nene and Peterborough Cathedral are not being fully utilised. The South Bank site is between the Nene and the Peterborough to March railway line. A spokesperson for Peterborough Investment Partnership said: “The exciting development includes the refurbishment of the listed railway sheds and the creation of a vibrant riverside community, with residential, business and leisure uses.